Not only are you a great driver, you seem to be a great writer. Your safety tips are great and I might incorporate them into my bad area parking habits. Thanks for the information article. I just passed the Texas CDP tests but I experienced the exact same issue. Although I was thoroughly prepared for General knowledge, Combination and Air breaks, I wasn't ready for the Texas Special Requirements portion of the test. I failed on my first attempt and so I couldn't even test the other three. I returned today and passed all 4 tests. HRT is great but it won't help for the first Texas test. I did well on general knowledge and aced combination and air breaks. Anyway, for any other texas drivers, study the special requirements of the Texas manual very carefully. You will be asked some very irrelevant questions on that section. 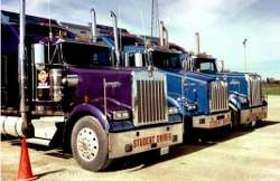 Google "texas cdl special requirements test" and you will find some helpful guides. For all the other sections, HRT will be all you need. Which sections are pertinent on the High Road Online Training program? I really appreciate The High Road Training Program. I've completed all the testable sections and will be checking out the practice tests. I'll be testing for my permit after I get my physical and clearance letters. I was comparing the manual from the Texas DMV with the sections in The High Road Training Program and noticed that the manual was missing a few sections. This post explains why the manual was different. I'd like to suggest that sections be marked "Required", "Required for Endorsement", "Useful but not required for testing". If the sections were clearly labeled, it would aid in the planning and prioritizing of study time. Again, thanks for the great program. I'll be recommending this site to anyone interested.